What happens when a wood worker, 7th grade social studies teacher, Mesa County Human Service worker and a former employee of the convention center come together because they want to play music? Badger:Badger! Describing their music is definitely difficult; you have to hear them to know what I mean. Their sound is very eclectic, synthesized, interesting, and very different. It’s “exhibitionist pop” or as they explained when I sat down with them at Baron’s to get to know them a little better, “High Desert Unique Pop”. 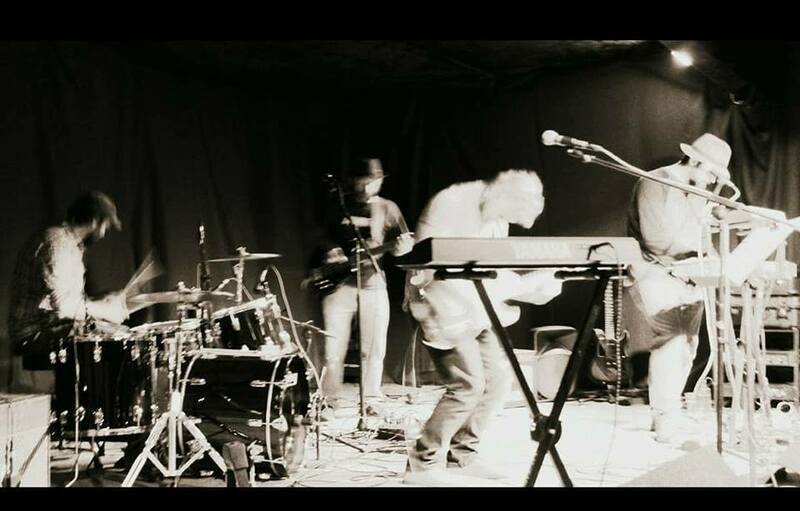 The quartet of musicians that make up the impressive Badger:Badger are Sean Simpson on synthesizer and guitar, Robert Chillino slapping bass, Grant Jackson on drums and Andy Moffitt playing keys. Get this: they connected with one another through ads seeking out musicians on Craigslist! Robert started playing drums at 22 and guitar at 27 but only started playing bass about one year ago and plays by ear. Sean said his Mom got him a guitar at 13 because he was having a hard time figuring out girls. Grant got a drum set when he was 13, took one lesson but didn’t have the attention span, so he’s learned his skills also playing by ear. Andy has been playing piano since the ripe ol’ age of three and started guitar at 12. Both of his parents were music instructors, his Mom was an elementary school music teacher and his dad was the music director at church. So, technically, he is the only one with formal training. He said he’s mostly a guitar player and this is the first time that he’s played keys. All of them do consider themselves to be multi-instrumentalists. None of the members are Colorado natives but landed up here and call the Grand Valley home for now. Robert is originally from New York but moved here at 13. Grant also hails from NY State, growing up close to Montreal, and after spending time in Alaska moved to Colorado. Sean is from the LBC and moved here because of gentrification of the area a few years ago. Andy is originally from Georgia and left chasing the west after attending school in North Carolina. Now, as I mentioned, they met through Craigslist with random music ads, bringing them together to make music only a year ago. They all agreed that they wanted to have original music that they enjoy with Sean doing most, if not all of the writing. The inspiration for the group was born from Sean going to a local thrift shop and finding a $300.00 synthesizer for $8.00 (apparently he’s done this twice in two different states!). It was agreed that they wanted a sound that is electronic with heavy beats, heavy guitar; music that isn’t necessarily easy to listen to but creative. Trust me when I say, their music is awesomely easy to listen to and their live shows are a treat to witness! The bands influences range from jam bands to Modest Mouse with a dash of Oingo Boingo vocal vibrato. How the name of the band came about is a little fuzzy, but Sean remembers he was at the computer one day and saw a Honey Badger video and mentioned how the badger was all cute but goes nuts and is a total badass; that they’re flat, but different, but cool. The colon just because he likes the grammar of it, it looks different. Badger:Badger has talked about recording but are more focused on writing and performing more original songs. You can find a couple of their songs on Soundcloud and social media pages with the release of their song Hey Yellow this past October. Their live shows are a spectacle that begs you to get up, move and feel good. You’re in luck because they’ll be playing Baron’s (538 Colorado Avenue) on November 10, 2018 with support from Night Whip and Molly Mountain. They’re all in for getting together to just play music despite all the things that happen in life. They have bonded through creative effort despite all the oddities. Fanastical fairy tale story thanks to Craigslist! ll see you on the dance floor!